1. Outdoor Food Fight- Now this sounds a little ‘nutty’, but it’s something that will blow off some serious cabin fever type steam, all while feeding the local wildlife! Be prepared to make a SERIOUS mess! Using wildlife friendly foods means you don’t have to clean up what lands outside and not on you, because your furry neighbors will be glad to do it for you! Gather some aging and dried fruits, a few seeds and nuts. Head outside, then, go for it old school food fight style! If you want to get really messy, grab some peanut butter and make ‘snowballs’ out of the peanut butter, seeds and fruits. Then, chuck them at each other. Or, try to hit a target like a branch high up in a tree and see who can get closest to it. Believe this - the squirrels and birds will be singing their approval of this outdoor activity. 3. Snowball Fight - If you’ve ever seen the movie Elf, you know what type of snowball fight we’re talking about. 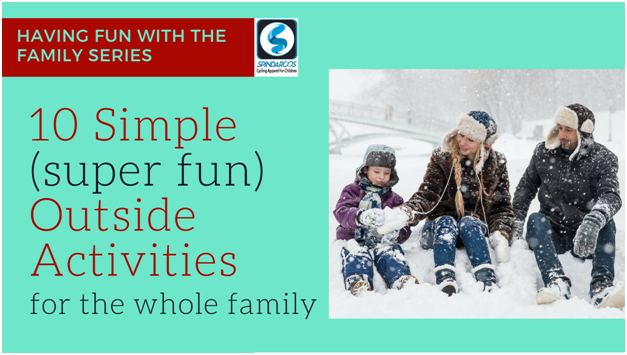 Have the family claim their own spot at the park or in the yard and hunker down, make a zillion snowballs, then let the snowball frenzy commence. You may not be able to sling them at your opponents quite as quickly as Buddy, but that doesn’t matter! What matters is that you make sure to throw the perfect snowball that makes it past the coat and melts down your opponents back. 4. S’more and Hot Cocoa Fun - Who says s’mores are only for camping in the summertime? Grab some chocolate, graham crackers, marshmallows (and an adult or two) and get to building some delicious s’mores. You can use the burner on your stove to make the marshmallows (adult supervision is an absolute must) or you can make them in the oven! Just layer the graham crackers, chocolate and marshmallows like you would for any delicious s’more, and pop a whole bunch of them in the oven for 4-5 minutes at 400 degrees. Don’t forget about the hot cocoa! Add extra marshmallows to that, too! Next, bundle up and head outside to enjoy your treats while you look at the stars and snuggle in a warm blanket. 5. Build a Snow Fort - This is best done in a big snow bank because it’s easier to dig out a cool igloo type hole in the side of a snow bank than it is to build the fort from the ground up, but either way is a total blast! The secret to a great snow fort is making sure to pack the snow tightly so that the ‘walls’ stay together nicely. After you’re done building, you can even make fun snow chairs and a snow table inside the fort! 6. Hiking and Snowshoeing - Find a family friendly trail, grab plenty of water and some snacks and head on out to explore the great outdoors. If you don’t have snowshoes, there are plenty of places around town that you can rent them from. 7. Scavenger Hunt - SO FUN! Sit down together with a pencil and some paper. Think of about 15 things in nature that you can ‘hunt’ for - a yellow leaf, a squirrel, a bird feeder, etc. You can make the list more difficult for older kiddos, and simpler for toddlers and littler ones. Have everyone write their own copy of the list, or make a copy for littles. Bundle up and head out for a wintertime, outdoor scavenger hunt! 8. Make peanut butter and seed bird feeders - This is so much fun for everyone, especially the birds and squirrels! Save up a week’s worth of toilet paper rolls. Poke a little holiday ornament hanger through one end of the roll. Using a spoon, cover the rolls with peanut butter, then roll them in a plate of seeds and dried fruits. Using the ornament hanger, hang them on a branch in your yard or on the deck, then watch the wildlife chow down on their treats! Take some pictures, too! 9. Winter Football Game - Get the family bundled up, grab a football and head outside for an awesome game of touch football! Have the kids ask neighborhood friends if they’d like to join and make a day of it! Bring some pre-made snacks and lots of water! 10. Tubing - You don’t have to go to a fancy ski resort to enjoy tubing. Just find a decent sized hill around town, head on up and bounce on down, then do it all over again! Make sure to pop on a helmet for safety.